The text in theatre was predominant for so long that we've known Theatre History, maily as a history of drama. Well, theatre began as un-scripted ritual, as we all know. Theatre doesn't have to depend on words in order to communicate with us. We call it -- theatricality (see Glossary). 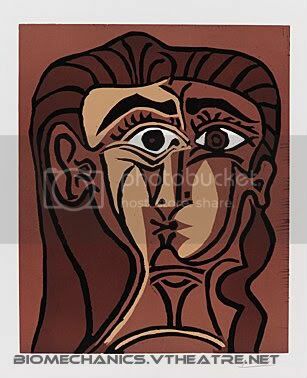 The BM were born at the End of Language, Novel, at the Era of Film, globalization and needs for the new universal language as always at the times of the great historical changes and mass migrations. I shouls mention maretialism in many forms from Marxism to Objectivism. And of course the revolution in science and technology, when the matter became equal to energy (Einstein). The physicality of the world was under the centuries of rediscovery since the eraly modernity (the Age of Reason instead of the Religion). Physics became the new religion of the century. Why should we be surprised that the physical theatre came on stage? Was it a conflict with the "spiritual" -- according to the ideologies of the time, the physical was the only true form of the ideal! To understand BM, you have to understand the meaning of THEATRICALITY, which requires physicalization and visualization. This is SHOW business, my friends. You have to show all the ideas you wish to communicate. There is no contradiction in this demand between Method and BM: one the famous lines by Stanislavsky during the rehearsals: "I don't see it!" Working on a scene or monologue, I ask actors to go for rehearsing for "Physicality Only"! I ask them to examine the scene from Physical POV: what is expressed, what is not? I tell them that I am Russian and I do not understand English; they have to make sure that non-English speaker can understand them. It's theatre, my friends! I can understand dance and music (both were born from theatre). PS. Often I see that actors afraid that they acting will become "mechanical" if they go from every single movement... Well, all I can say that musicians play their scales and athletes do the specific exercises to develop arms, chest and very small movements in order to develop SMART BODY, the body which remembers it all! We do the rehearsals for the same reason; we memorize the lines and blocking. More "mechanics" we put into the show, the more organic it gets! One Act Fest The Moving Body: Teaching Creative Theatre by Jacques Lecoq -- Jacques Lecoq was born in Paris in 1921. He taught until the day before his death in 1999. David Bradby is Professor of Drama and Theatre Studies at Royal Holloway University of London. His is a director, translator, and the author of, among other books, Mise en scene: French Theatre Now. Theare is physical. Period. It better be, when everything else becomes digital. Theatre is the last refuge of the Real! Theatre's future is bright. When everything will be virtual, Theatre Live Shows will be like a ritual and church. I made a page for Commedia (and Kabuki) in order to make sure that the traditions of physical theatre behind BM are not forgotten. Theatre was born of rites, song and dance of the flesh. But physical doesn't have to be something opposite to psychological. Meyerhold v. Stanislavsky? The conflict between those two Russian directors belongs to history. I keep repeating it: Meyerhold developed the theory of Biomechanics for his practical needs as a director. Not only for professional actors, but because in his revolutionary mind he believed that ANYBODY could and should act. A dedicated Marxist, he thought that every peasant or worker can do theatre, if only they can have the right tools, the technique! Closeup (CU). The Extreme CU (XCU) is very difficult to acheive, but this is the highest dramatic point for the actor. Not only it is motionless moment, but it is also the silent moment, known as "dramatic pauses"! Unlike in film, it's almost impossible to "cut" from LS to CU, you have to "zoom" from one "shot" to another; you have to go through MS to get to the CU. Tight Medium Shot (MS). 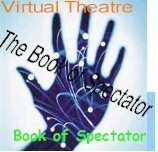 Most of soap acting is done within MS.
More on the subject @ Virtual Theatre pages; the zone between Theatre and Film. Meyerhold wanted his actors to be athletes. He had a circus as model! Actor's body must work. Body Acts! For updates -- Body Page. Now, take a look at the text of your monologue. I advise your to visualize the basic breakdown (framing) of your body as a cameraman does. There are simple ways to focus public's attention with director applies: I can ask designers to do it. The face can be permanently framed with the costume or hat, or wig. I can ask for light or even simply move the actor to the window, which will frame the action. Do you want to have MLG? Place his in the door-frame! Or get him into arm-chair.... You got the idea? THR BioMechanics: Click to View or Add Links. "Mechanical" has negative connotations, of course, and this is wrong. "Mechanical" means repeatable, means that we can do it time and again, every time, regardless. The idea of bio-mechanical is a contradiction in itself. "Bio" (life) is something that is always new, non-repeatable at all! And this is the trick; you train yourself to the point when you can do it, no matter what, and -- then on the top of it you add inspiration and improvisation of the live theatre. The body has to learn it through repetitions; the musicians and the athletes do it. The body has to remember it, not you. We call it -- skills. We call it physical memory: you remembers how to ride a bike, how to swim, how to walk -- you do not have to "remember" it. Biomechanics are supposed to FREE your for acting! The same with the blocking and costumes, with lines and light. The limitations are good for you! Get it mechanical for the sake of the "bio" -- the part which will be new every night. New @ BioMechanics: Click to View or Add Links. I used masks and screens to force my students to focus on a specific part of the body, which does the "acting" (the shadow theatre is also a good tool). In your monologue select any line and try to express it with the different parts of your body. Three ways -- good. Five - excellent. Body & Body Parts: "Shot-by-Shot" method. Body as your prop. Bring in class your monologues (including the character analysis -- must be posted on the BioMX Forum). Where is the "center of gravity" in your design? Which parts of your body do you designate for characterization? Use the samples: Monologues and see more in the SHOWS directory. Stay with the COMEDY! Read the next chapter before class! Post the question to the List after the class. 2004 project -- looks like I have to spend a lot time before the yoga warmups can be incorporated. Descriptions, functions, order. It took 90 min to introduce it in class (workshop). I can't spend more than ten minutes of class time for warmups; a must before presentations. I am old and now I appreciate my body, because it about to leave me. We taught that the soul leaves the body. Nonsense! Read Beckett. Body gets tired serving them -- spirit, mind, will and etc.